It was approximately 30 years ago since we saw the last apartment development boom in cities like Toronto and marketing for lease-ups has changed dramatically in the last 30 years. Identifying and creating a brand is an incredibly important piece of the puzzle and will determine your long-term success. Developers must ensure that their building name, slogan, colours, fonts, brand guidelines match their target demographic for the property. A misfire with your branding can set your entire strategy off from the get-go and create a disconnect between your target market and your product. Property owners and managers often underestimate the power of on-site signage. Great signage can turn a construction site -- consisting of nothing more than a hole in the ground -- into immediate hype. In high traffic areas, on-site signage is of even greater importance. Think about how much money companies spend on billboards each year. You own your real estate, it is by far your most valuable asset, so make sure to use it by creating effective signage! The more prominent your on-site signage is (especially your URL), the more attention you will grab from street traffic. 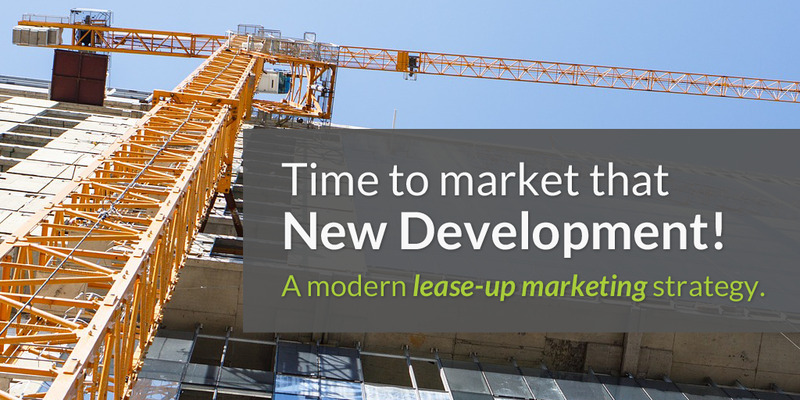 A big misconception in lease-up marketing is that you can begin promotion within 2-4 months before construction is complete. If you really want to go after the highest possible rents, the best possible tenants and lease-up in the fastest possible way -- the process should start significantly earlier with pre-registration. It may be hard for a marketer with incomplete information to launch a full website with accurate content when the building is still under construction. That is why it is important to build a professional "temporary" website that includes your branding, has some renderings, is mobile responsive, contains project news, and most importantly gives the visitor an opportunity to pre-register for updates. The registration database should sync with an e-mail marketing platform. At this stage of the game you aren't trying to lease-units, you are simply trying to grow a targeted list of prospective renters with interest in your project. Growing your list of prospects is one thing. Keeping in touch with them to hold their interest and move them along the sales cycle is a bit more strategic. An email marketing campaign where you drip development updates and news related to your development on a monthly-basis can be an effective way to stay in-touch without spamming the prospect. Additionally, a well-planned display retargeting campaign can be an inexpensive way to continually and consistently stay in front of your prospects. It's important that display ads change constantly with new messages to avoid over serving the same ads to a prospect. If you are unfamiliar with display ads or retargeting, here is another great article to check out. Including all of these items will ensure that your website generates quality traffic, & quality leads from quality tenants. Like them or not, one thing is for sure - you can't live without ILS' in the rental space. It's pivotal that your information from your website is synced with all the major listing sites in your market. For a few hundred dollars a month you can ensure that your property is being advertised on every relevant ILS. For Landlords and Property Managers, ILS' continue to be the most highly targeted online traffic your money can buy. Depending on your budget and overall strategy, ILS' will likely make up for 30% or greater of your online leads. Often, the biggest hassle with ILS' is having to manage your inventory on several sites and keep the sites up-to-date with your content. If you use a proper website CMS meant for your industry, there is likely to be a platform that syndicates your content directly from your website to most of the major ILS'. Digital campaigns can be expensive and slightly less efficient (per dollar spent) than ILS', email marketing and on-site signage. A full digital campaign works best when you are ready to convert traffic to leases. With that being said, a digital campaign has the ability to drive more online traffic than all other sources combined. A well strategized and professionally managed Pay-Per-Click (PPC) campaign using Google AdWords will drive highly targeted traffic to your website. At this stage, you will also want to ramp up your retargeting efforts and also consider the use of Facebook retargeting as well. Without a proper digital strategist in place you may end up throwing money out the window, so be mindful to select a company that has experience in handling PPC for lease-ups. With increased competition, as developers continue to venture into the purpose-built rental industry, it's more important than ever to have a proper plan in place with set budgets and timelines. Most importantly, surround yourself with a team of professionals who can handle the implementation of the plan. In the rental industry, marketing has the tendency to be overlooked and undervalued because of our market conditions and vacancy rates. However, a small investment in a sound marketing strategy can go a long way towards ensuring your building fills up quickly with the highest possible rents and the best possible tenants.